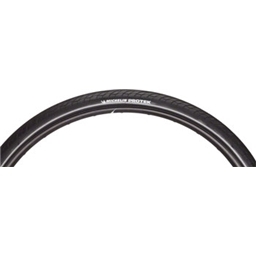 Very well-constructed tire, holds air well, resistant to punctures, and fits the rims on an older steel touring bike. The bike is now used for riding near the edge of an urban area, so needed a tire that handles well on both paved and unpaved surfaces, yet rolls easily and smoothly. This tire has performed well under those conditions. Bought these tires to replace 1-3/8 Kendas, and even though these are nominally a narrower tire, the construction is so beefy that it takes up more space and I had to raise the fenders to get complete clearance. Medium weight 26" tires with puncture protection guard strip. Flexible and easy to install. Great traction and ride. Michelin quality. Side reflective stripe. Haven't used yet. Come on spring.